From the nursery rhyme "Oranges and Lemons," to Victor Hugo’s gothic classic The Hunchback of Notre Dame, to the sentimental The Bells of St. Mary’s, to London’s Big Ben and Philadelphia’s Liberty Bell, sonorous masses of moving metal have historically played a prominent theme in our culture and history. Trinity Church Wall Street has its own long and as-yet unwritten history of bells. A new chapter in this history began 10 years ago. In October 2006 a set of 12 change-ringing bells, cast at the Taylor foundry in Loughborough, England, arrived by ship and were then blessed in the courtyard of Trinity Church. Later that month the bells were installed in the tower. The bells are the gift of Dr. Martin Faulkes, a London ringer, and they remain the only 12-bell change-ringing installation in the United States. Indeed, Trinity is one of only two 12-bell change-ringing towers in North America (the other being St. James’s Cathedral in Toronto). Change ringing originated in England in the 1600s, and it remains a distinctive way of ringing bells. Unlike carillons and chimed bells, which usually play melodies or harmonic compositions as on a piano, and unlike “continental” ringing where the bells ring randomly, we change ringers strike the bells one at a time in memorized patterns that have their own logic and elegance. We ring each bell once, to create a row. Then we ring a new row, but we ring the bells in a different order. Row follows row, and with each new row, the order of the bells changes. Given change ringing’s complexity, Trinity was fortunate 10 years ago to have a handful of experienced ringers living in the tri-state area. Since the installation, these experienced ringers have trained Trinity’s band, which now numbers about 20 ringers who attend regularly, and about that many more again who ring occasionally. Trinity has also become a popular destination for ringers visiting from around the world. You are warmly invited to the ringing room on October 9 after the 11:15am service. 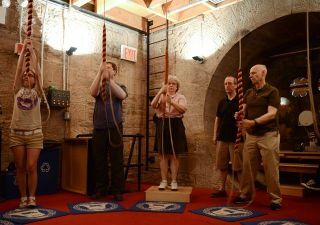 And anyone who wants to learn the art of change ringing—which involves a time commitment and a lengthy learning process—is welcome to contact the Trinity Ringers here. The Trinity Ringers will endeavor to make you part of the team as quickly as possible! We hope that over the past 10 years, parishioners, visitors, and neighbors have enjoyed the sound of Stedman Triples, Cambridge Major (like many musical compositions, ours too have names), and everything else we ring on Sunday mornings, for weddings, and on other occasions. We look forward to many more years of change ringing at Trinity. David Henry is the Secretary of the Trinity Ringers.